Established in 1977, we are a family owned and operated HVAC contractor, located in Eudora, KS. Westerhouse Heating and Cooling specialize in residential and light commercial heating systems and cooling systems. Rely on us for the installation, service, and maintenance of these systems. Our products include furnaces, air conditioners, heat pump, geothermal, mini-split system, and air quality products. We are a licensed and insured contractor in Douglas County and the surrounding areas and we serve Eudora, De Soto, Johnson County, Lawrence, and the surrounding areas. Our mission is to provide exceptional service to all of our heating and air customers. We are committed to providing quality products that we stand behind, friendly customer service and acting quickly and effectively when needed. Are you looking for HVAC services in Eudora, KS? Then rely on Westerhouse Heating and Cooling. We provide exceptional heating, cooling and air service to all our customers. Call now to schedule an appointment. Aaron is married to Tara Chumley as of March 23, 2019! Congratulations you two! He has a Yellow Lab named Lucy. Aaron grew up in Eudora, KS and attended Eudora High School, Labette Community College, and Baker University. He likes baseball and roots for KU, KC Royals and The Chiefs. David is married to Caitly. They have a 2-year-old named Henry and a dog named Hank. David grew up in Eudora and attended Eudora High School and Johnson County Community College.What he likes best about Westerhouse is "the other employees are fun to be around and I like meeting and talking to customers." Jordan has 2 dogs. Both are Labs and they are named Tucker and Abby. He grew up in Eudora and went to Eudora High School and Johnson County Community College. His favorite sports are basketball and football. He roots for KU, The Royals, The Chiefs, and Creighton.What Jordan likes best about working at Westerhouse is " I enjoy begin around the employees and meeting different customers each day. My customers should know that I am honest and hardworking." James is married to Melanie. They have a 4-year-old son named Daniel and a cat named Bud. James grew up in Massachusetts and attended Rhode Island Tech. He likes Road Racing. "I have great co-workers and a great boss. I like being able to be a craftsman with my work." Chris is married to Jessica. They have 2 children and 2 dogs. He grew up in DeSoto, KS and went to high school there. His favorite sport is Soccer and cheers for The Chiefs. 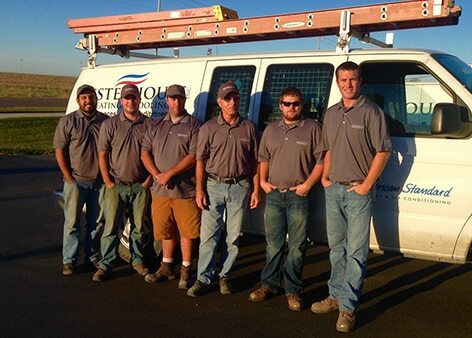 "What I like best about working with Westerhouse in the atmosphere and the camaraderie with the people I work with. " Connor has a dog named Sophie and grew up in Baldwin City, KS. He attended The University of Kansas. Connor likes to cook when he is not working. So it may not be a surprise to know his nickname is "Cookie". Connor cheers for the Jayhawks, The Chiefs, and Royals." I like the fact that every day is different at Westerhouse." Alicia grew up in Leavenworth County and has 2 grown children. She attended school in Linwood. Alicia roots for The Chiefs, Royals, Cardinals and Sporting KC. "What I like best about working at Westerhousew is the employees and employers are great to work with and are very friendly. Westerhouse is the best company I have ever worked for. " Sandi is married to one of the owners, Mike! They have 2 boys who are both involved with the business. Mike and Sandi have a Golden retriever. Sandi grew up in Hutchinson, KS. She went to school at Hutchinson Community College and Adela Hale Business College. She roots for The Royals, KU Basketball and The Chiefs.